Mobility on Demand (MOD) Market size is set to exceed USD 200 billion by 2024; according to a new research report by Global Market Insights, Inc.
Mobility on demand market is expected to grow over the forecast time span due to the increasing inclination of customers toward shared services rather than ownership. The costs of owning vehicles including components, such as insurance, repair & maintenance, and depreciation, are more than the sharing of vehicles. Furthermore, volatility in fuel prices is encouraging the users to switch to the shared transport, propelling the mobility on demand market growth. Increasing government initiatives to implement these services in countries are expected to accelerate the mobility on demand market growth. The governments in various developed economies including the U.S. and Germany are funding such projects to foster innovations and provide technical assistance to the industry players. For instance, the Federal Transit Administration (FTA) of the U.S. has signed an agreement with a national non-profit organization, Shared-Use Mobility Center (SUMC) to provision the successful implementation of these projects across the country. Technological advancements and the emerging IoT trend are further propelling the mobility on demand market growth. Rise in the number of connected vehicles and the increasing penetration of smartphones are anticipated to drive the industry. Various government organizations are focusing on encouraging digitalization for the overall economic growth. Technological developments, such as autonomous and AI-enabled vehicles, are expected to revolutionize the industry. Innovations, such as electric vehicles and GPS-based navigation systems, are anticipated to fuel the mobility on demand market growth. Inadequate transportation infrastructure is expected to hinder the mobility on demand market growth in countries including India, Brazil, and Mexico. Deteriorating conditions of road infrastructure discourage the commuters to travel by roads, thus challenging the growth of car rental market. Furthermore, the integration of these services with the traditional transport infrastructure is an expensive and time-consuming process. Lack of awareness regarding these services is pushing people to use public transport extensively, hindering the industry growth. The growing popularity of car sharing services is expected to propel the mobility on demand market growth. Reduction in travel costs and emissions of greenhouse gases are some of the drivers of the car-sharing industry. Station-based car sharing services currently sized at over 600 million encourage the commuters to walk, cycle, or use public transportation to the car-stations. Technological advancements, such as smartcards, GPS tracking, and app-based reservation of cars, will drive the car sharing market growth, impacting the industry growth. 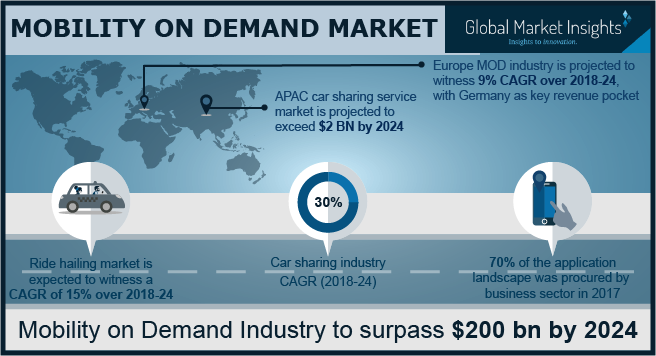 The mobility on demand (MOD) market in private applications is expected to witness a significant growth over the forecast timespan due to growing inclination of individual commuters toward shared services. Increasing traffic congestion in urban areas is compelling the people to opt for services such as ride hailing for running daily errands such as grocery shopping, thus propelling the ride hailing market growth to reach over USD 100 billion by 2024. Increased convenience of booking these services through apps on smartphones and websites is further increasing the demand for mobility on demand market in private applications. Key players in the mobility on demand market comprise Lyft, DriveNow GmbH, Didi Chuxing, Enterprise Rent-A-Car, Gett, and Uber Technologies. The industry is highly fragmented in nature and big players, such as Uber and Didi Chuxing, are adopting strategies such as M&As to penetrate into newer regions and gain share. For instance, in February 2018, Uber announced its intention to enter Vietnam by partnering with MoMo, a mobile wallet company in the country. Also, several regional players, such as Ola and Grab, are gaining a strong foothold in their respective regions by acquiring operations from foreign players such as Uber. For instance, in early 2018, Grab announced that the company is in preliminary talks with Uber Technologies to strike a deal to acquire its operations in Singapore.